I think it was fitting to inspect my hives on Mother’s Day as Rosemary, Rue and Knives 2.0 each have brought thousands of new bees into this world. 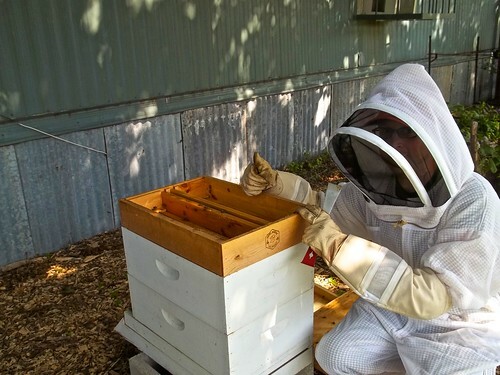 We had one of those rare cool May days in Austin, and it was a pleasure spending time outside peeking into the hives. I think I’ve finally figured out Rosemary’s hive. I had no comb on the inner cover this week so adding that 2nd super was a good call on my part. I also noticed that Rosemary loves building out frames 1-4 first and ignoring frames 5-8. I need to re-check the level of the hive next week as that is the only thing I could think of that would cause this behavior. To combat this, I did a frame switch to get the 1st super 8 full frames of drawn comb. We will see if Rosemary continues this trend when I check on the hive next week. 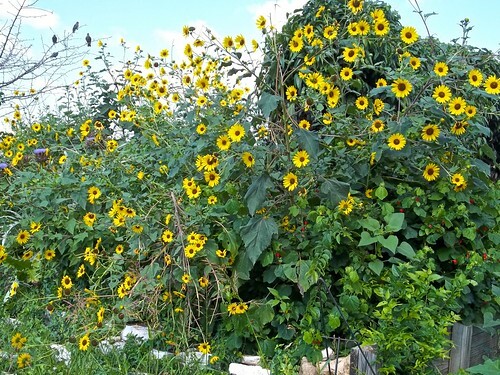 The recent rain in Austin is really making the gardens bloom and this patch of sunflowers is just one of many for Rosemary to forage on. 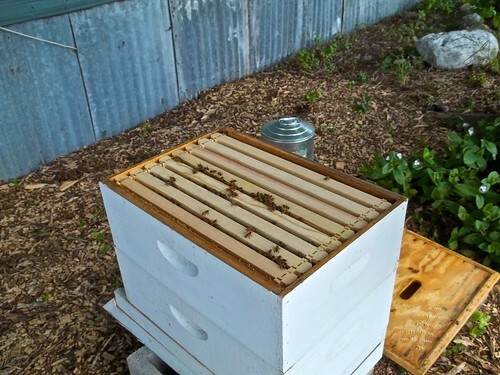 Meanwhile at Baab-Brock Farms, Rue continues to build up quickly, and I added a 3rd super to her hive. Here is a representative shot of the tight brood patterns this queen is producing. Last but not least, I opened up Knives 2.0’s hive and what a difference a new queen and a few weeks makes. What was once a grumpy queen-less hive is now a thriving gentle one. 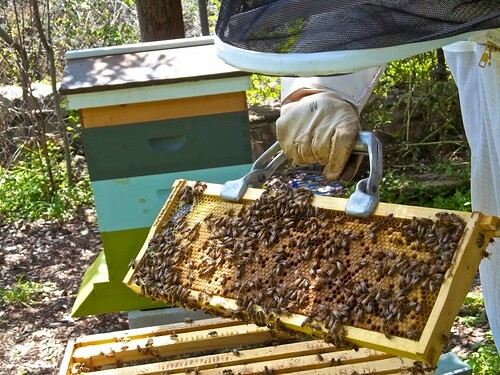 She is also laying quite well, and I’m hopeful that if the rainfall in Austin continues over the next month or two, I’ll actually get some honey this year. 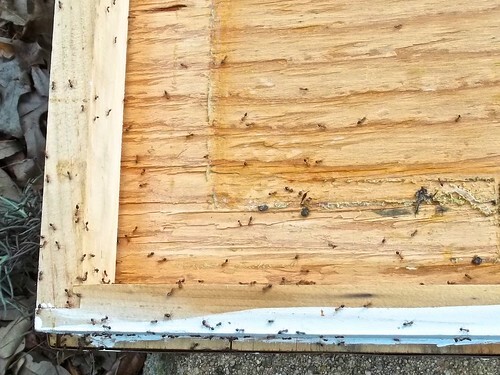 The only blight on the day was a colony of carpenter ants that took up residence in the outer cover of Knives’ hive. They don’t seem to be entering the hive at all, but just going up and down the outside of the hive. I replaced the cover with a fresh ant-free one, but now need to figure out how to get the ants out of the old one. I’ve also ordered a big 5 pound container of cinnamon which is a natural ant repellent. We’ll see how well that works in the coming weeks. Are frames 1-4 nearest the entrance? My bees seem to build from the entrance outwards and are slow at populating the back frames. It’s the same when the super goes on, they build over the brood nest first at the front and centre of the super as that’s where it’s warmest. Nice to see them all doing so well! 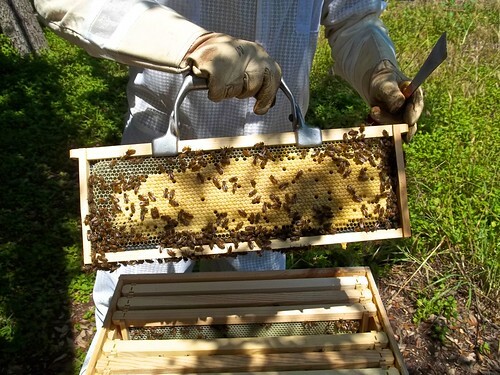 How are your hives configured? My entrance is situated where they have access to all 8 frames equally. I do still have the entrance reducer on, but the entrance is on the side with frames 5-8. Ah, so you have your frames positioned the “cold way”, at right angles to the entrance. I have mine the “warm way”, running parallel to the entrance. It doesn’t affect the colony too much either way, but it does create different shape brood patterns. Probably a British thing then!